Time for a board game comparison. These two games are similar in many ways, one aimed at kiddos, one at adults. 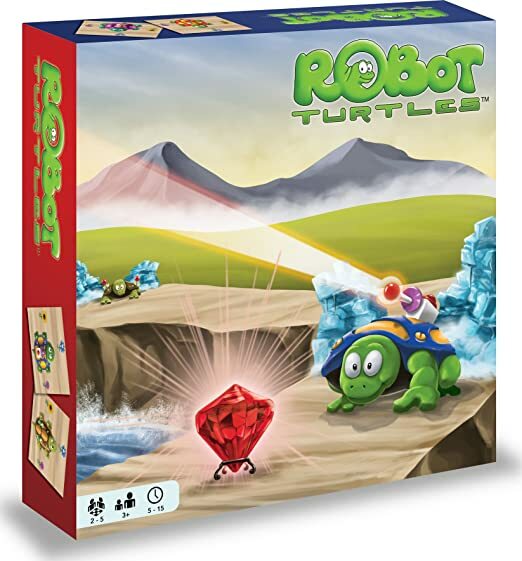 Robot Turtles: This game is designed to sneakily teach programming skills to tots. Okay -- I was actually skeptical about the game when I first learned about it. I've seen some "educational" games that try to teach letters and numbers at the utter expense of game play. I hope my kids have fun and learn critical thinking skills with board games, so I'm aiming for a different kind of "educational". But this game hits "fun" and "critical thinking" on the nose. The game is actually a maze that the kids work their turtles through -- a maze that the adult (or senior child) designs every time you pull out the game. The players use their cards to "program" their turtle's movements. The Turtle Mover then follows those exact instructions, regardless of intent. Don't worry; mistakes can be rectified with use of the bug card. It was fun and refreshing to play a game where the whole point is to let them figure out how it works, instead of spending the first few games teaching rules. The game also nicely adds complexity as you get better at it. This is still a big hit at our house -- many, many programs later. 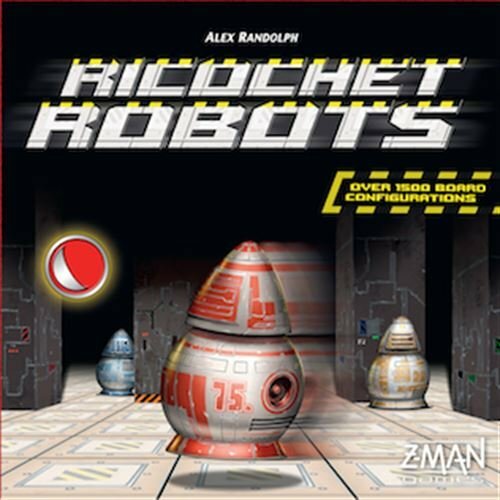 Ricochet Robot: In this game, you try to find the shortest path for the robots -- who can only move in straight lines -- to reach their targets. It's very spacial, almost maze-like, trying to use the various walls and/or other robots on the board to bounce off of just right. There is no turn-taking. Everyone tries to solve it at the same time, so the game plays as many people as you can fit around the board, which is nice. There's also a great catch-up mechanism. If you've solved more puzzles than anyone else, you have to focus hard to stay ahead. If you're behind, you've got a very good chance to catch up in the scoring. Neither of these games is particularly cut-throat and they're low on player interactions. They're more like puzzles that you solve independently (Turtles) or a puzzle that you're trying to solve faster and more efficiently than the rest of the players (Robots). But I love both of these. I love the logical planning efforts in Robot Turtles, and I love how after a few rounds of Ricochet Robots, my head either hurts or I start to get really good at it (or both). They're mind-stretching and full of spacial reasoning. Both come highly recommended.